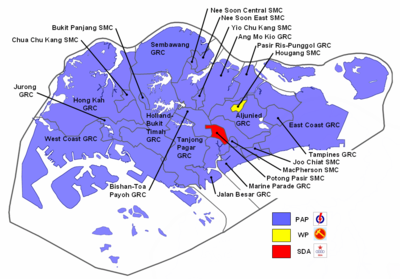 Delta's Dark Den of Destruction: A By-Election in Singapore as Well? Malaysiakini, Malaysia Today, and The Malaysian Insider tend to be the "trifecta" of recommended reading in order to get an understanding of Malaysia's politics. But when the dust settles, the hype dies down and you're a bit tired of reading about the same old issues again and again (like Anwar and his by-election), it's time to look elsewhere. The unfortunate demise of Bukit Batok’s MP Dr. Ong Chit Chung has thrown up opportunities for both the PAP and the opposition parties in Singapore, especially for J.B. Jeyaretnam's newly formed Reform Party. If a by-election is held and the PAP receives a strong majority of votes, it will be a strong testimonial of the party’s infallability even in times of economic uncertainty. This will certainly help boost the ruling party’s image as one that is strong regardless of economic conditions. If a by-election is held, and in the unfortunate event that the seat is lost to an opposition candidate, there can be a silver lining in the cloud - the party will then understand that, perhaps, some of its policies in recent times have lost touch with the electorate. From 1988 to 2001, the late Dr. Ong served in the Bukit Batok constituency for two terms. From 2001 onwards, he was a part of the 5-member Jurong GRC (Group Representation Constituency). • The Straits Times - By-election: Pragmatism or Principle?